You know the craziest thing I saw in any of this year’s E3 press conferences? 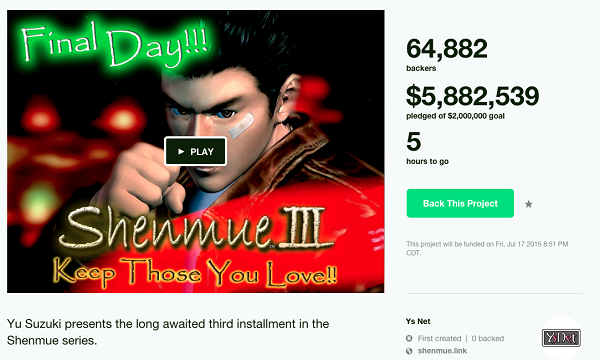 It was when Sony promoted a Kickstarter for Yu Suzuki’s Shenmue 3. The fact that one of the biggest players in the video game business would give Suzuki a platform to promote his crowdfunded sequel to a 14 year old, action-adventure Dreamcast game is …well, it’s indicative of the interesting times we live in. And apparently a lot of people found the idea of a Shenmue sequel very interesting. The Kickstarter raised $6.33 million from 69,320 fans –far beyond its initial goal of $2 million. Of course, I wonder about the psychology behind someone’s decision to put money into this project, and I think one of the most common decision-making biases was in play: the affect heuristic. The term, first coined by psychologist Paul Slovik, describes our tendency to let our feelings about something dominate other evaluations of it. If your work supervisor elicits positive emotions from you, you are more likely to attend to his virtues and downplay his faults. If a law or policy is cast in a light that elicits negative emotions (e.g., “this is a war on Christmas!”) then people tend to pay more attention to it and support arguments against it. This happens because “Is this person/policy/product good?” is a hard question to answer. “How does this person/policy/product make me feel?” is a much easier question. And our minds have a persistent habit of slyly substituting an easy question for a hard one whenever they get the chance. Will Yu Suzuki be able to make the game with the money he gets out of this? Even if he can, will it be enough to let him make the game he wants? Is the game he wants to make also one that I will want to play? I mean, what is a Shenmue game released in 2017 even going to look like? Do I have any evidence that Suzuki can lead a team to make a modern game? If Suzuki does create a “modern” game, will it still capture what I loved about the first two games? If he doesn’t modernize it, could I actually enjoy playing an old-style game more like the first two? Have you guys seen any sailors? Those are tough questions. Some of them are probably impossible to answer right now, so you’d have to resort to assigning probabilities to various outcomes. That’s even tougher. And because that’s such an easy question to answer, it’s probably the one that most influences people’s decisions. The answer to one question unconsciously substituted for another. And it’s not just Shenmue 3.. It happens with other Kickstarted games, like Star Citizen. And Wasteland 2. And Elite: Dangerous. And plenty more to come.